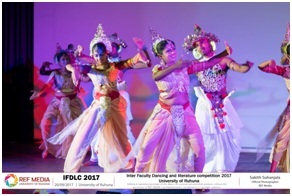 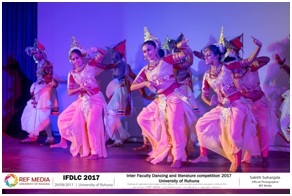 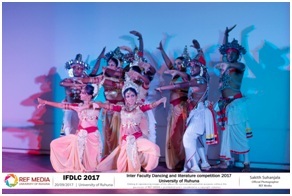 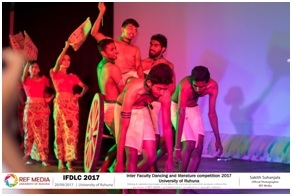 Two dancing groups from the Faculty of Engineering participated for the ''Traditional Sri Lankan Dancing'' and the ''Free Style Dancing'' competition items and both groups were able to secure 3rd places in respective events, bringing credit to the Faculty of Engineering, which is being the only faculty who got places in both the dancing competition items. 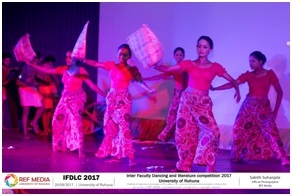 Below are the students participated for the dancing items. 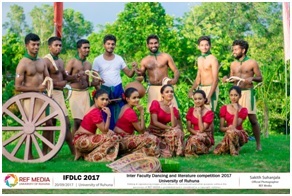 Weerasinghe L.M., Prabodha J.P.T.H., Diwakara M.C., Kudahetti R.M., Dilshani K.L.I., Rajamanthree U.R.T.Y., Dharmasena M.K.R.B., Gunarathana W.R.N., Amunugama C.S.B.M.R.N.L.K., Pilapitiya P.H.M.S.K., Jayamanna J.M.I.N., Dissanayaka Y.D.A.U. 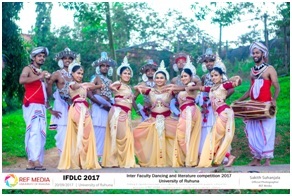 Preshani L.B.S.D., Mendis B.P.M., Jayawardhane M.A.K.D., Helapita L., Kumari K.M.M.G.Y.P., Pramodi J.P.M., Chinthaka P.K.D., Wijethunga K.M.A.G.N.D.B., Liyanage W.P.C.R., Nandasena K.K.P., Weeraarachchi W.A.P.M., Dissanayaka Y.D.A.U. 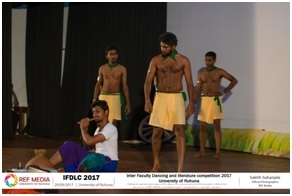 Additionally, in the literature competitions, Perera M. A. G. P. won the 2ndplace for poems (Sinhala medium)and Jayawardhane M. A. K. D. secured the 3rd place for the free verse (Sinhala medium).